My name is Gideon Irving. I am a professional globetrotting House Showman passionately dedicated to the art of being unreasonable. 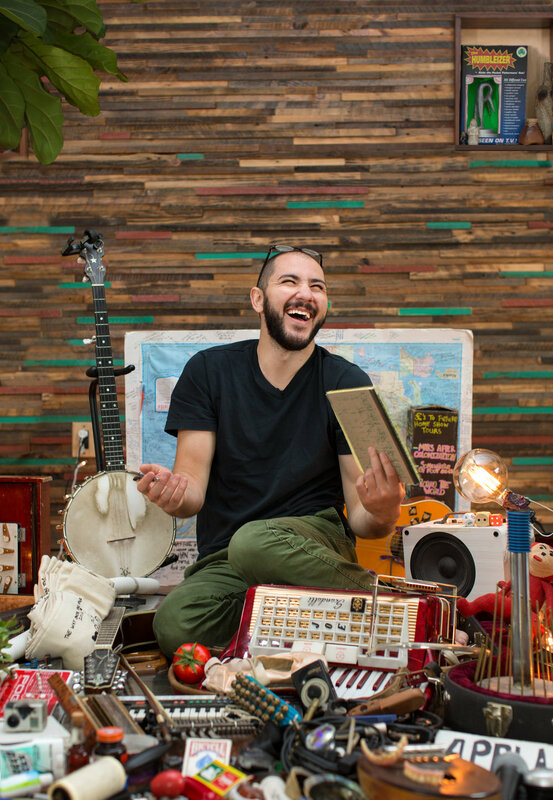 I am a New York City native, I play the banjo, and I have spent most of the past 10 years creating elaborate one-person shows and performing them in private living rooms, kitchens, attics, lofts, basements, garages, barns, trailers, woodsheds, yurts, tee-pees, root cellars, sugar shacks, cooling towers, and occasionally in more traditional contexts like theaters and festivals. I love playing shows. I love it a lot, even more than I love eating sandwiches, which I love a great deal. My show is an eclectic, ever-evolving mash-up of song, storytelling, and slapstick driven by my deep abiding love for the element of surprise. In the course of a typical performance I deploy suitcases full of peculiar noise-makers, outlandish apparel, and bizarro gadgetry whilst engaging in daring and ill-advised stunts of both the mental and physical variety. As a creator and performer, I like challenging myself to do things that at first glance seem impossible, and I like challenging my audience to put aside typical notions of what constitutes a “show” or “performance” in favor of something more interactive and communal. My essential aim is to bring people together in moments of genuine wonder, delight, bewilderment, and joy. I was first inspired to perform in private homes in 2011 when I saw the great Julian Koster (of Neutral Milk Hotel and The Music Tapes) play an enchanting Christmas-themed show in a living room in Bayside, Queens, wherein he accompanied himself on the singing saw and numerous other obscure instruments whilst seated amidst a cluster of enormous glowing lawn ornaments. He was a glorious magnificent eccentric doing whatever he wanted, from the heart, in the warmest of environments. At that point I had spent two years in a touring folk band, playing in small music venues across the country. I loved traveling and performing and meeting all sorts of strange and delightful people along the way but I just wasn't excited about those spaces. I didn't like clubs; I didn't like bars; I didn't like loud. In many ways those venues seemed to inhibit the very thing that I was after as an artist and performer, which was a real sense of connection, intimacy, and openness with my audience. Seeing Julian perform in that Queens apartment was a revelation. It was a glimpse into a beautiful intriguing alternate universe and I thought I'd like to explore that world. So my life as a House Showman began. In 2012 I embarked upon my Way Over There Tour, traveling the entire perimeter of New Zealand by bicycle with a trailer full of instruments and doo-dads in tow. I arrived on the island with only 5 homes booked via Couchsurfing.com but four months later I had played 84 home shows, made countless new friends, and survived multiple brushes with death by 18-wheeler. Shortly after returning home, I spent a month criss-crossing New York City on rollerblades for my Staying Put Tour, pushing my instruments and doo-dads in a modified shopping cart through rain and traffic and dog poop to perform in apartments all over the city. In 2013 I developed The Gideon and Hubcap Show, a two-man music and comedy extravaganza with my dear friend Dr. Nate “Hubcap” Sloan, which has since birthed a kid-centric offspring, The Gideon and Hubcap Show for Kids, Adults and Everyone Else. A commission with The Foundry Theater in 2014 led to the creation of Living Here: A Map of Songs which I toured through 45 homes in all five boroughs of New York City. In 2016 I joined forces with NYC’s All For One Theater to create my first theater-based production, My Name is Gideon: I’m Probably Going to Die Eventually which premiered at the Edinburgh Fringe Festival ahead of an 8-week run at New York’s Rattlestick Playwrights Theater and a subsequent ongoing touring incarnation. In 2018 I debuted Twinkle Clumps, an all-new solo home show, which I performed in private dwellings across Australia, Japan, and North America. I am currently based in Boulder, Utah (population 200) as I prepare for a cross-country tour of the United States on horseback in 2019. At the end of every show I unfurl a world map and invite audience members to write down the name and location of friends or family anywhere on earth who they think might enjoy hosting me. This is how I've found 90% of my hosts thus far (I’ve gone through more than 30 maps). I've returned to many homes multiple times with different versions of my show, introduced like-minded hosts to each other, created an intercontinental craft project with audience members and supporters that has spanned more than 6 years, and treated every show and tour as a kind of workshop leading to the next iteration. I like that these projects have no end in sight. I see a living room as an endlessly expansive venue with infinite room for new ways to play, sing, laugh, invite. Over the past several years I have performed in more than 600 homes across four different continents. People often ask me “so what's the plan?”, the implication being that playing in private homes must be leading me to something grander, larger and better. The truth is, my sense of what I want to say and how I want to say it evolves constantly as I travel from home to home, as does my understanding of what I can ask of my audiences in these small and intimate spaces. Exploring theaters and working with talented creative teams has been beyond stupendous, but I cannot imagine leaving the living rooms. It's too much fun! And there are too many comfy couches. I am always searching for new invitations, proposals, and possibilities around the globe. All are gratefully welcomed at itstruemynameisgideon@gmail.com. This week I have begun a new course of study with my friend Dave. My horse teachers kinda said "Alright you've got a basic fundamental understanding of some horse things. Now you need to go learn how to take care of yourself in nature so it can be natural to you and you can focus your energies on taking care of your horses." So they sent me to Dave. I'm writing to you from Boulder, Utah, a small town of 200 ranchers, cowboys, Mormons, atheists, artists, primitive skills experts, weirdos and wanderers. There is actually a guy named Wandering Will who I believe lives in the mountains and occasionally wanders into town? Haven't met him yet, nice nickname though. I moved out here to train with horses and learn to live outdoors leading up to my horse tour in 2019 that I've been rambling on about for years. I'm doing stuff things again. It's been a mighty year of kids show making, theater show designing/promoting and horse tour planning learning. Now I'm bringing a new home-show through Australia and Tokyo! Cause..... well, I gotta do shows somewhere. I'll be driving around all of Australia, 8,000 miles! It is a very large place.